This is one action figure Dragon Ball fans will not want to miss! 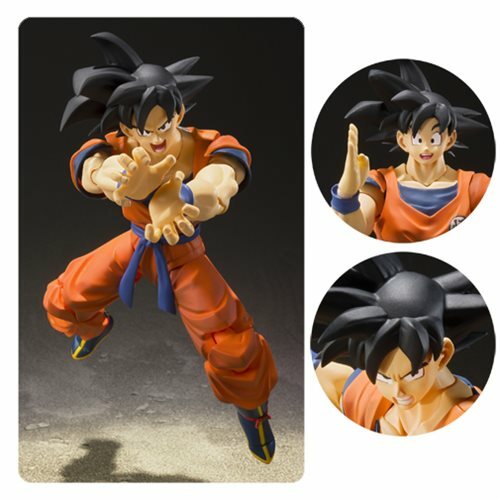 Son Goku, one of the world's post popular characters, joins the SH Figurarts line, perfectly replicated down to the Chinese characters on his clothing. The figure incorporates cutting-edge action figure technology that lets you replicate Son Goku's trademark battle poses. The Dragon Ball Z Son Goku A Saiyan Raised On Earth SH Figuarts Action Figure includes 2x left and 4x right optional hands, and 3x optional expression parts. Measures about 5 1/2-inches tall. Ages 15 and up.